Women Along the Historical Way - History? Because it's Here! Florence Nightingale founded the nursing profession, but she was also gifted in mathematics, a prolific author, and a confirmed feminist. The Florence Nightingale Museum, tucked in the grounds of St. Thomas’ Hospital in London, opposite the Houses of Parliament, celebrates Florence Nightingale and her contribution to nursing. lamp to light her way to comfort and tend injured soldiers. Florence Nightingale School of Nursing and Midwifery and is part of King’s College London. Hampshire, and a service is always held there on the Sunday after her birthday. art and science of nursing. Gentlewomen in Upper Harley Street in London. near modern day Istanbul in November 1854, and began to care for the wounded. they made her known throughout the world. served as the curriculum cornerstone for Nightingale and other nursing schools. Notes on Hospitals, another of her popular books, deals with the correlation of sanitary techniques to medical facilities. Her work laid the foundation for the United States Sanitary Commission during the American Civil War, and she trained Linda Richards, the first professional American nurse. rejected their lives of intellectual inactivity and comfort for the world of social service and intellectual growth. school and worked extensively with prisoners. upbringing, family fortune, and reputation for a hierarchical approach to nursing. 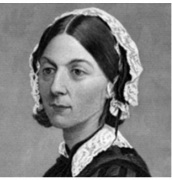 Dossey, Barbara, Florence Nightingale: Mystic, Visionary, Healer. Lippincott, Williams & Willing, 2000. Bostridge, Mark, Florence Nightingale: The Making of an Icon, Farrar, Straus, and Giroux, 1st Edition, 2008.